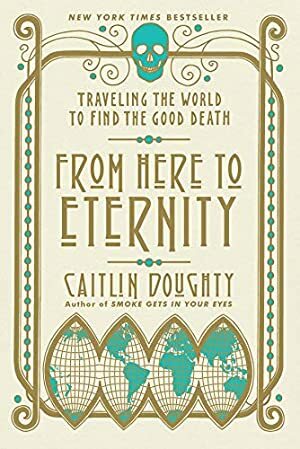 Fascinated by our pervasive fear of dead bodies, mortician Caitlin Doughty embarks on a global expedition to discover how other cultures care for the dead. From Zoroastrian sky burials to wish-granting Bolivian skulls, she investigates the world's funerary customs and expands our sense of what it means to treat the dead with dignity. Her account questions the rituals of the American funeral industry -- especially chemical embalming -- and suggests that the most effective traditions are those that allow mourners to personally attend to the body of the deceased. Exquisitely illustrated by artist Landis Blair, From Here to Eternity is an adventure into the morbid unknown, a fascinating tour through the unique ways people everywhere confront mortality. Track It. This book has been $8.61 within the past year. Log In to track Caitlin Doughty on eReaderIQ. to be notified each time the price drops on any book by Caitlin Doughty. to stop tracking Caitlin Doughty. Log In to track Landis Blair on eReaderIQ. to be notified each time the price drops on any book by Landis Blair. to stop tracking Landis Blair. We started tracking this book on March 11, 2017. This book was $12.59 when we started tracking it. The price of this book has changed 71 times in the past 769 days. The current price of this book is $10.30 last checked one day ago. This lowest price this book has been offered at in the past year is $8.61. The lowest price to date was $8.61 last reached on February 13, 2019. This book has been $8.61 2 times since we started tracking it. The highest price to date was $12.59 last reached on March 11, 2017. This book has been $12.59 one time since we started tracking it. We last verified the price of this book about one day ago. At that time, the price was $10.30. This price is subject to change. The price displayed on the Amazon.com website at the time of purchase is the price you will pay for this book. Please confirm the price before making any purchases.